Table views are versatile user interface objects frequently found in iOS apps. A table view presents data in a scrollable list of multiple rows that may be divided into sections. A table view has only one column and allows vertical scrolling only. It consists of rows in sections. Each section can have a header and a footer that displays text or an image. However, many table views have only one section with no visible header or footer. Programmatically, the UIKit framework identifies rows and sections through their index number: Sections are numbered 0 through n – 1 from the top of a table view to the bottom; rows are numbered 0 through n – 1 within a section. A table view can have its own header and footer, distinct from any section; the table header appears before the first row of the first section, and the table footer appears after the last row of the last section. A table view is an instance of the UITableView class in one of two basic styles, plain or grouped. A plain table view is an unbroken list; a grouped table view has visually distinct sections. A table view has a data source and might have a delegate. The data source object provides the data for populating the sections and rows of the table view. The delegate object customizes its appearance and behavior. 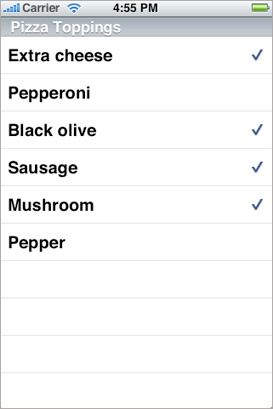 A table view draws its visible rows using cells—that is, UITableViewCell objects. Cells are views that can display text, images, or other kinds of content. They can have background views for both normal and selected states. Cells can also have accessory views, which function as controls for selecting or setting an option. The UIKit framework defines four standard cell styles, each with its own layout of the three default content elements: main label, detail label, and image. 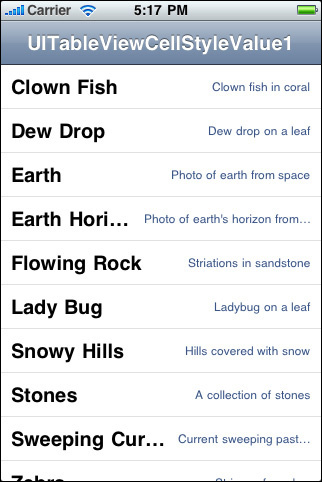 You may also create your own custom cells to acquire a distinctive style for your app’s table views. When you configure the attributes of a table view in the storyboard editor, you choose between two types of cell content: static cells or dynamic prototypes. Static cells. Use static cells to design a table with a fixed number of rows, each with its own layout. Use static cells when you know what the table looks like at design time, regardless of the specific information it displays. Dynamic prototypes. Use dynamic prototypes to design one cell and then use it as the template for other cells in the table. Use a dynamic prototype when multiple cells in a table should use the same layout to display information. Dynamic prototype content is managed by the data source at runtime, with an arbitrary number of cells. When users select a row (by tapping it), the delegate of the table view is informed via a message. The delegate is passed the indexes of the row and the section that the row is in. It uses this information to locate the corresponding item in the app’s data model. This item might be at an intermediate level in the hierarchy of data or it might be a “leaf node” in the hierarchy. 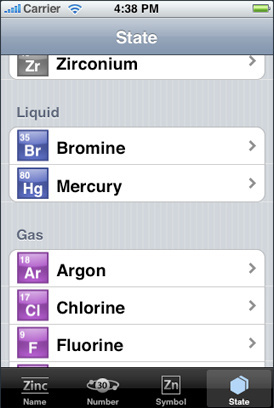 If the item is at an intermediate level, the app displays a new table view. If the item is a leaf node, the app displays details about the selected item in a grouped-style table view or some other kind of view. In table views that list a series of options, tapping a row simply selects its associated option. No subsequent view of data is displayed. Table views can enter an editing mode in which users can insert or delete rows, or relocate them within the table. In editing mode, rows that are marked for insertion or deletion display a green plus sign (insertion) or a red minus sign (deletion) near the left edge of the row. If users touch a deletion control or, in some table views, swipe across a row, a red Delete button appears, prompting users to delete that row. Rows that can be relocated display (near their right edge) an image consisting of several horizontal lines. When the table view leaves editing mode, the insertion, deletion, and reordering controls disappear. When users attempt to insert, delete, or reorder rows, the table view sends a sequence of messages to its data source and delegate so that they can manage these operations. The easiest and recommended way to create and manage a table view is to use a custom UITableViewController object in a storyboard. If your app is based largely on table views, create your Xcode project using the Master-Detail Application template. This template includes an initial custom UITableViewController class and a storyboard for the scenes in the user interface, including the custom view controller and its table view. In the storyboard editor, choose one of the two styles for this table view and design its content. At runtime, UITableViewController creates the table view and assigns itself as delegate and data source. Immediately after it’s created, the table view asks its data source for the number of sections, the number of rows in each section, and the table view cell to use to draw each row. The data source manages the application data used for populating the sections and rows of the table view. Before reading this document, you should read Start Developing iOS Apps Today to understand the basic process for developing iOS apps. Then read View Controller Programming Guide for iOS for a comprehensive look at view controllers and storyboards. Finally, to gain valuable hands-on experience using table views in a storyboard, read the tutorial Your Second iOS App: Storyboards. The information presented in this introduction and in Table View Styles and Accessory Views summarizes prescriptive information on table views presented in iOS Human Interface Guidelines. You can find a complete description of the styles and characteristics of table views, as well as their recommended uses, in the chapter Content Views. For guidance on how to use the standard container view controllers provided by UIKit, see View Controller Catalog for iOS. This document describes split view controllers and navigation controllers, which can both contain table view controllers as children. Table views come in distinctive styles that are suitable for specific purposes. In addition, the UIKit framework provides standard styles for the cells used to draw the rows of table views. It also gives you standard accessory views (that is, controls) that you can include in cells. There are two major styles of table views: plain and grouped. The two styles are distinguished mainly by appearance. A table view in the plain (or regular) style displays rows that stretch across the screen and have a creamy white background (see Figure 1-1). A plain table view can have one or more sections, sections can have one or more rows, and each section can have its own header or footer title. (A header or footer may also have a custom view, for instance one containing an image). When the user scrolls through a section with many rows, the header of the section floats to the top of the table view and the footer of the section floats to the bottom. A variation of plain table views associates an index with sections for quick navigation; Figure 1-2 shows an example of this kind of table view, which is called an indexed list. The index runs down the right edge of the table view. Entries in the index correspond to section header titles. Touching an item in the index scrolls the table view to the associated section. For example, the section headings could be two-letter state abbreviations, and the rows for a section could be the cities in that state; touching at a certain spot in the index displays the cities for the selected state. The rows in indexed lists should not have disclosure indicators or detail disclosure buttons, because these interfere with the index. The simplest kind of table view is a selection list (see Figure 1-3). A selection list is a plain table view that presents a menu of options that users can select. It can limit the selection to one row or allow multiple selections. A selection list marks a selected row with a checkmark (see Figure 1-3). A grouped table view also displays a list of information, but it groups related rows in visually distinct sections. As shown in Figure 1-4, each section has rounded corners and by default appears against a bluish-gray background. Each section may have text or an image for its header or footer to provide some context or summary for the section. A grouped table works especially well for displaying the most detailed information in a data hierarchy. It allows you to separate details into conceptual groups and provide contextual information to help users understand it quickly. The headers and footers of sections in a grouped table view have relative locations and sizes as indicated in Figure 1-5. On iPad devices, a grouped table view automatically gets wider margins when the table view itself is wide. In addition to defining two styles of table views, the UIKit framework defines four styles for the cells that a table view uses to draw its rows. You may create custom table view cells with different appearances if you want, but these four predefined cell styles are suitable for most purposes. The techniques for creating table view cells in a predefined style and for creating custom cells are described in A Closer Look at Table View Cells. The default style for table view rows uses a simple cell style that has a single title and an optional image (Figure 1-6). This style is associated with the UITableViewCellStyleDefault constant. The cell style for the rows in Figure 1-7 left-aligns the main title and puts a gray subtitle under it. It also permits an image in the default image location. This style is associated with the UITableViewCellStyleSubtitle constant. The cell style for the rows in Figure 1-8 left-aligns the main title. It puts the subtitle in blue text and right-aligns it on the right side of the row. Images are not permitted. 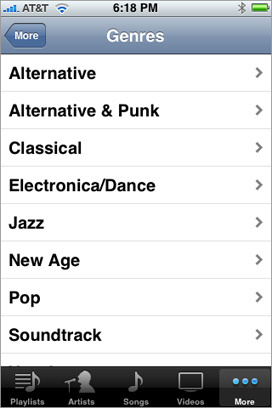 This style is used in the Settings app, where the subtitle indicates the current setting for a preference. It is associated with the UITableViewCellStyleValue1 constant. The cell style for the rows in Figure 1-9 puts the main title in blue and right-aligns it at a point that’s indented from the left side of the row. The subtitle is left aligned at a short distance to the right of this point. 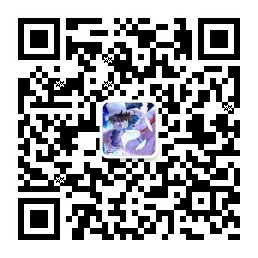 This style does not allow images. 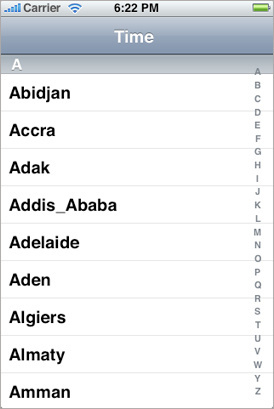 It is used in the Contacts part of the Phone app and is associated with the UITableViewCellStyleValue2 constant. Disclosure indicator—UITableViewCellAccessoryDisclosureIndicator. You use the disclosure indicator when selecting a cell results in the display of another table view reflecting the next level in the data model hierarchy. Detail disclosure button—UITableViewCellAccessoryDetailDisclosureButton. You use the detail disclosure button when selecting a cell results in a detail view of that item (which may or may not be a table view). Checkmark—UITableViewCellAccessoryCheckmark. You use a checkmark when a touch on a row results in the selection of that item. This kind of table view is known as a selection list, and it is analogous to a pop-up list. Selection lists can limit selections to one row, or they can allow multiple rows with checkmarks. Instead of the standard accessory views, you may specify a control (for example, a switch) or a custom view as the accessory view. The table view programming interface includes several UIKit classes, two formal protocols, and a category added to a Foundation framework class. 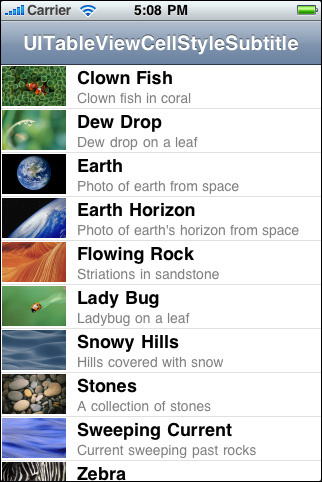 A table view itself is an instance of the UITableView class. You use its methods to configure the appearance of the table view—for example, specifying the default height of rows or providing a subview used as the header for the table. Other methods give you access to the currently selected row as well as specific rows or cells. You can call other methods of UITableView to manage selections, scroll the table view, and insert or delete rows and sections. UITableView inherits from the UIScrollView class, which defines scrolling behavior for views with content larger than the size of the window. UITableView redefines the scrolling behavior to allow vertical scrolling only. The UITableViewController class manages a table view and adds support for many standard table-related behaviors such as selection management, row editing, table configuration, and others. This additional support is there to minimize the amount of code you have to write to create and initialize your table-based interface. You don’t use this class directly—instead you subclass UITableViewController to add custom behaviors. The data source adopts the UITableViewDataSource protocol. UITableViewDataSource has two required methods. The tableView:numberOfRowsInSection: method tells the table view how many rows to display in each section, and the tableView:cellForRowAtIndexPath: method provides the cell to display for each row in the table. Optional methods allow the data source to configure multiple sections, provide headers and/or footers, and support adding, removing, and reordering rows in the table. The delegate adopts the UITableViewDelegate protocol. This protocol has no required methods. It declares methods that allow the delegate to modify visible aspects of the table view, manage selections, support an accessory view, and support editing of individual rows in a table. An app can make use of the convenience class UILocalizedIndexedCollation to help the data source organize the data for indexed lists and display the proper section when users tap an item in the index. The UILocalizedIndexedCollation class also localizes section titles. Many table view methods use index paths as parameters or return values. An index path identifies a path to a specific node in a tree of nested arrays, and in the Foundation framework it is represented by an NSIndexPath object. UIKit declares a category on NSIndexPath with methods that return key paths, locate rows in sections, and construct NSIndexPath objects from row and section indexes. For more information, see NSIndexPath UIKit Additions. As noted in Data Source and Delegate, the data source must return a cell object for each visible row that a table view displays. 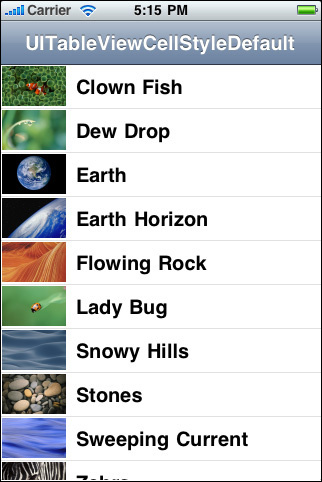 These cell objects must inherit from the UITableViewCell class. This class includes methods for managing cell selection and editing, managing accessory views, and configuring the cell. You can instantiate cells directly in the standard styles defined by the UITableViewCell class and give these cells content consisting of one or two strings of text and, in some styles, both image and text. Instead of using a cell in a standard style, you can put your own custom subviews in the content view of an “off-the-shelf” cell object. You may also subclass UITableViewCell to customize the appearance and behavior of table view cells. These approaches are all discussed in A Closer Look at Table View Cells. A common use of table views—and one to which they’re ideally suited—is to navigate hierarchies of data. A table view at a top level of the hierarchy lists categories of data at the most general level. Users select a row to “drill down” to the next level in the hierarchy. At the bottom of the hierarchy is a view (often a table view) that presents details about a specific item (for example, an address book record) and may allow users to edit the item. This section explains how you can map the levels of the data model hierarchy to a succession of table views and describes how you can use the facilities of the UIKit framework to help you implement such navigation-based apps. For a navigation-based app, you typically design your app data as a graph of model objects that is sometimes referred to as the app’s data model. You can then implement the model layer of your app using various mechanisms or technologies, including Core Data, property lists, or archives of custom objects. Regardless of the approach, the traversal of your app’s data model follows patterns that are common to all navigation-based apps. The data model has hierarchical depth, and objects at various levels of this hierarchy should be the source for populating the rows of a table view. Note: To learn about the Core Data technology and framework, see Core Data Starting Point. A well-designed app factors its classes and objects in a way that conforms to the Model-View-Controller (MVC) design pattern. The app’s data model consists of the model objects in this pattern. You can describe model objects (using the terminology provided by the object modeling pattern) in terms of their properties. These properties are of two general kinds: attributes and relationships. Note: The notion of “property” here is abstractly related to, but not identical with, the declared property feature of Objective-C. A class definition typically represents properties programmatically through instance variables and declared properties. Attributes represent elements of model-object data. Attributes can range from an instance of a primitive class (for example, an NSString, NSDate, or UIColor object) to a C structure or a simple scalar value. Attributes are generally what you use to populate a table view that represents a “leaf node” of the data hierarchy and that presents a detail view of that item. A model object may also have relationships with other model objects. It is through these relationships that a data model acquires hierarchical depth by composing an object graph. Relationships are of two general kinds in terms of cardinality: to-one and to-many. To-one relationships define an object’s relationship with another object (for example, a parent relationship). A to-many relationship, on the other hand, defines an object’s relationship with multiple objects of the same kind. The to-many relationship is characterized by containment and can be programmatically represented by collections such as NSArray objects (or, simply, arrays). An array might contain other arrays, or it could contain multiple dictionaries, which are collections that identify their contained values through keys. Dictionaries, in turn, can contain one or more other collections, including arrays, sets, and even other dictionaries. As collections nest in other collections, your data model can acquire hierarchical depth. 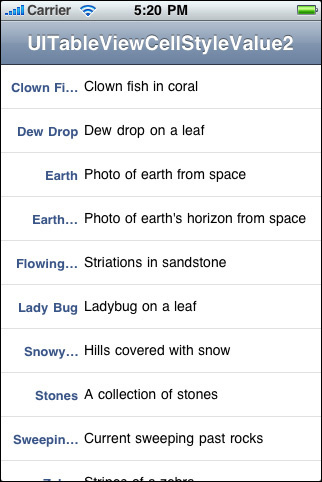 The rows of a plain table view are typically backed by collection objects of the app’s data model; these objects are usually arrays. Arrays contain strings or other elements that a table view can use when displaying row content. When you create a table view (described in Creating and Configuring a Table View), it immediately queries its data source for its dimensions—that is, it requests the number of sections and the number of rows per section—and then asks for the content of each row. The data source fetches this content from an array in the appropriate level of the data-model hierarchy. In many of the methods defined for a table view’s data source and delegate, the table view passes in an index path to identify the section and row that is the focus of the current operation—for example, fetching content for a row or indicating the row the user tapped. An index path is an instance of the Foundation framework’s NSIndexPath class that you can use to identify an item in a tree of nested arrays. The UIKit framework extends NSIndexPath to add a section and a row property to the class. The data source should use these properties to map a section and row of the table view to a value at the corresponding index of the array being used as the table view’s source of data. In the sequence of table views in Figure 3-1, the top level of the data hierarchy is an array of four arrays, with each inner array containing objects representing the trails for a particular region. When the user selects one of these regions, the next table view lists names identifying the trails within the selected array. When the user selects a particular trail, the next table view describes that trail using a grouped table view. 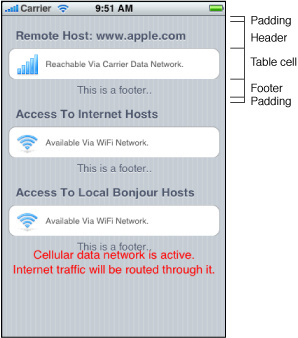 Note: You could easily redesign the app in Figure 3-1 to have only two table views. 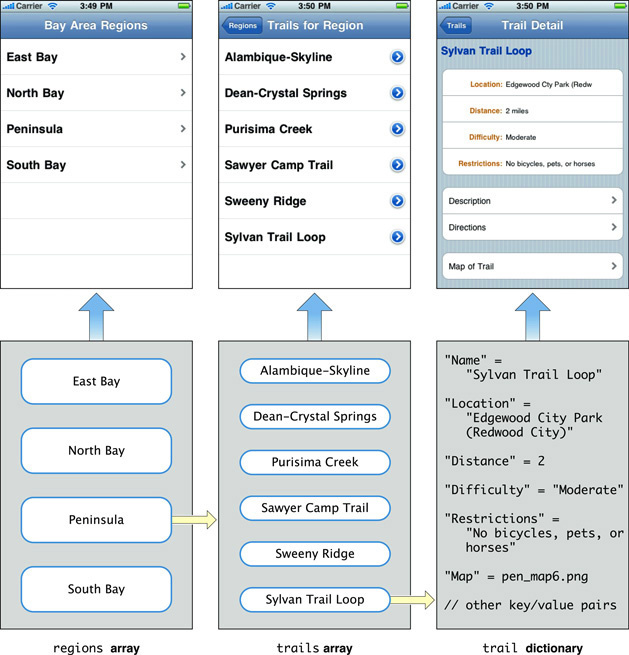 The first table view would be an indexed list of trails by region. The second table view would display the detail for a selected trail. The UIKit framework provides a number of view controller classes for managing common user interface patterns in iOS. View controllers are controller objects that inherit from the UIViewController class. They are an essential tool for view management, especially when an app uses those views to present successive levels of its data hierarchy. This section describes how two subclasses of UIViewController, navigation controllers and table view controllers, present and manage a succession of table views. Note: This section gives an overview of view controllers to provide some background for the coding tasks discussed later in this document. To learn about view controllers in depth, see View Controller Programming Guide for iOS. The UINavigationController class inherits from UIViewController, a base class that defines the common programmatic interface and behavior for controller objects that manage views in iOS. Through inheritance from this base class, a view controller acquires an interface for general view management. After it implements parts of this interface, a view controller can autorotate its view, respond to low-memory notifications, overlay “modal” views, respond to taps on the Edit button, and otherwise manage the view. A navigation controller maintains a stack of view controllers, one for each of the table views displayed (see Figure 3-2). It begins with what’s known as the root view controller. When the user taps a row of the table view (often on a detail disclosure button), the root view controller pushes the next view controller onto the stack. The new view controller’s table view visually slides into place from the right, and the navigation bar items are updated appropriately. When users tap the back button in the navigation bar, the current view controller is popped off the stack. As a consequence, the navigation controller displays the table view managed by the view controller that is now at the top of the stack. Navigation bars are a user-interface device that enables users to navigate a hierarchy of data. Users start with general, top-level items and “drill down” the hierarchy to detailed views showing specific properties of leaf-node items. The view below the navigation bar presents the current level of data. A navigation bar includes a title for the current view and, if that view is lower in the hierarchy than the top level, a back button on the left side of the bar; the back button is a navigation control that the user taps to return to the previous level. (The back button by default displays the title for the previous view.) A navigation bar may also have an Edit button—used to enter editing mode for the current view—or custom buttons for functions that manage content (see Figure 3-3). A UINavigationController manages the navigation bar, including the items that are displayed in the bar for the view below it. A UIViewController object manages a view displayed below the navigation bar. For this view controller, you create a subclass of UIViewController or a subclass of a view controller class that the UIKit framework provides for managing a particular type of view. For table views, this view controller class is UITableViewController. For a navigation controller that displays a sequence of table views reflecting levels within a data hierarchy, you need to create a separate custom table view controller for each table view. The UIViewController class includes methods that let view controllers access and set the navigation items displayed in the navigation bar for the currently displayed table view. This class also declares a title property through which you can set the title of the navigation bar for the current table view. Although you could manage a table view using a direct subclass of UIViewController, you save yourself a lot of work if instead you subclass UITableViewController. The UITableViewController class takes care of many of the details you would have to implement if you created a direct subclass of UIViewController to manage a table view. The recommended way to create a table view controller is to specify it in a storyboard. The associated table view is loaded from the storyboard, along with the table view’s attributes, size, and autoresizing characteristics. The table view controller sets itself as the data source and the delegate of the table view. Note: You can create a table view controller programmatically by allocating memory for it and initializing it with the initWithStyle: method, passing in either UITableViewStylePlain or UITableViewStyleGrouped for the required table view style. When the table view is about to appear for the first time, the table view controller sends reloadData to the table view, which prompts it to request data from its data source. The data source tells the table view how many sections and rows per section it wants, and then gives the table view the data to display in each row. This process is described in Creating and Configuring a Table View. 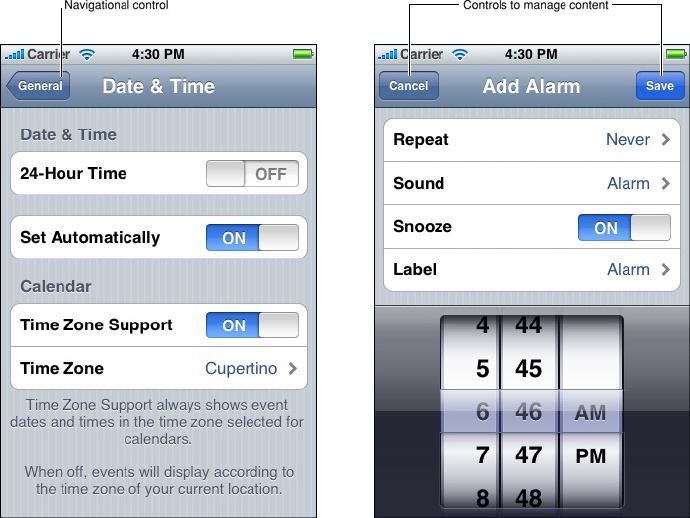 The UITableViewController class also performs other common tasks. It clears selections when the table view is about to be displayed and flashes the scroll indicators when the table finishes displaying. In addition, it responds properly when users tap the Edit button by putting the table view into editing mode (or taking it out of editing mode if users tap Done). The class exposes one property, tableView, which gives you access to the managed table view. Note: A table view controller supports inline editing of table view rows; if, for example, rows have embedded text fields in editing mode, it scrolls the row being edited above the virtual keyboard that is displayed. It also supports the NSFetchedResultsController class for managing the results returned from a Core Data fetch request. The UITableViewController class implements the foregoing behavior by overriding loadView, viewWillAppear:, and other methods inherited from UIViewController. In your subclass of UITableViewController, you may also override these methods to acquire specialized behavior. If you do override these methods, be sure to invoke the superclass implementation of the method, usually as the first method call, to get the default behavior. Note: You should use a UIViewController subclass rather than a subclass of UITableViewController to manage a table view if the view to be managed is composed of multiple subviews, only one of which is a table view. The default behavior of the UITableViewController class is to make the table view fill the screen between the navigation bar and the tab bar (if either are present). If you decide to use a UIViewController subclass rather than a subclass of UITableViewController to manage a table view, you should perform a couple of the tasks mentioned above to conform to the human interface guidelines. To clear any selection in the table view before it’s displayed, implement the viewWillAppear: method to clear the selected row (if any) by calling deselectRowAtIndexPath:animated:. After the table view has been displayed, you should flash the scroll view’s scroll indicators by sending a flashScrollIndicators message to the table view; you can do this in an override of the viewDidAppear: method of UIViewController. A UITableViewController object—or any other object that assumes the roles of data source and delegate for a table view—must respond to messages sent by the table view in order to populate its rows, configure it, respond to selections, and manage editing sessions. In the rest of this document, you learn how to do these things. However, there are certain other things you need to do to ensure the proper display of a sequence of table views in a navigation-based app. Note: This section summarizes view-controller and navigation-controller tasks, with a focus on table views. For a thorough discussion of view controllers and navigation controllers, including the complete details of their implementation, see View Controller Programming Guide for iOS and View Controller Catalog for iOS. At this point, let’s assume that a table view managed by a table view controller presents a list to the user. How does the app display the next table view in the sequence? When a user taps a row of the table view, the table view calls the tableView:didSelectRowAtIndexPath: or tableView:accessoryButtonTappedForRowWithIndexPath: method implemented by the delegate. (That latter method is invoked if the user taps a row’s detail disclosure button.) The delegate creates the table view controller managing the next table view in the sequence, sets the data it needs to populate its table view, and pushes this new view controller onto the navigation controller’s stack of view controllers. A storyboard provides the specification that allows UIKit to perform most of this work for you. Storyboards represent the screens in an app and the transitions between them. The storyboard in a basic app may contain just a few screens, but a more complex app might have multiple storyboards, each of which represents a different subset of its screens. The storyboard example in Figure 3-4 presents a graphical representation of each scene, its contents, and its connections. A scene represents an onscreen content area that is managed by a view controller. (In the context of a storyboard, scene and view controller are synonymous terms.) The leftmost scene in the default storyboard represents a navigation controller. A navigation controller is a container view controller because, in addition to its views, it also manages a set of other view controllers. For example, the navigation controller in Figure 3-4 manages the master and detail view controllers, in addition to the navigation bar and the back button that you see when you run the app. A relationship is a type of connection between scenes. In Figure 3-4, there is a relationship between the navigation controller and the master scene. In this case, the relationship represents the containment of the master and detail scenes by the navigation controller. When the app runs, the navigation controller automatically loads the master scene and displays the navigation bar at the top of the screen. A segue represents a transition from one scene (called the source) to the next scene (called the destination). For example, in Figure 3-4, the master scene is the source and the detail scene is the destination. When you select the Detail item in the master list, you trigger a segue from the source to the destination. In this case, the segue is a push segue, which means that the destination scene slides over the source scene from right to left. As the detail screen is revealed, a back button appears at the left end of the navigation bar, titled with the previous screen’s title (in this case, “Master”). The back button is provided automatically by the navigation controller that manages the master-detail hierarchy. Storyboards make it easy to pass data from one scene to another via the prepareForSegue:sender: method of the UIViewController class. This method is called when the first scene (the source) is about to transition to the next scene (the destination). The source view controller can implement prepareForSegue:sender: to perform setup tasks, such as passing information to the destination view controller about what it should display in its table view. Listing 3-1 shows one implementation of this method.